FILE - U.S. President Donald Trump's personal lawyer Michael Cohen (C) arrives at federal court in Manhattan, New York, May 30, 2018. Michael Cohen, under criminal investigation for his role as U.S. President Donald Trump's one-time lawyer, said Monday that his "first priority" is to protect his family and country, not the president. Cohen, a New York attorney, once described himself as "the guy who would take a bullet" for Trump, the real estate mogul turned politician. But now that special counsel Robert Mueller is investigating Cohen's role during Trump's 2016 presidential campaign and New York prosecutors probe Cohen's business deals, he took a decidedly different tack in an interview with ABC News. The 51-year-old lawyer signaled his willingness to cooperate with prosecutors in the two investigations, saying, "My wife, my daughter and my son have my first loyalty and always will. I put my family and country first." Until recently, Cohen played a key role in representing Trump, although not in any formal role in the White House. Cohen made a $130,000 hush money payment to adult film actress Stormy Daniels less than two weeks before the November 2016 election to buy her silence at the time about an alleged one-night affair she claims to have had with Trump in 2006, shortly after Trump's wife Melania gave birth to their son Barron. Some U.S. legal analysts have said the payment could be construed as a campaign finance law violation by Cohen. In recent months, Cohen has said he made the payment on his own initiative, but declined to answer a question from ABC's George Stephanopoulos whether Trump directed him to make the payment or promised to reimburse him. "I want to answer. One day I will answer," he said. "But for now, I can't comment further on advice of my counsel." In recent months, as investigators zeroed in on Cohen's representation of Trump and raided his New York office and the hotel where he has been staying, Trump weighed in with comments castigating the raid and saying he did not think Cohen would turn against him. 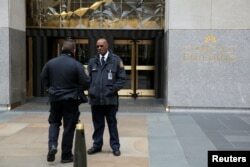 FILE - Police and security stand outside 30 Rockefeller Plaza, the location for the offices of U.S. President Donald Tump's personal lawyer Michael Cohen which was raided by the FBI, in Manhattan, New York, April 9, 2018. He called the Federal Bureau of Investigation's April raid that collected thousands of pages of documents an "attack on our country, in a true sense. It's an attack on what we all stand for." Cohen said, “Once I understand what charges might be filed against me, if any at all, I will defer to my new counsel, Guy Petrillo, for guidance.” Petrillo is a veteran former federal prosecutor turned defense attorney. Trump has long disparaged Mueller's investigation of Trump campaign links to Russia and whether he obstructed justice when he fired former FBI director James Comey last year at a time when he was leading the Russia probe before Mueller was appointed to take over the investigation. He said he did not like the term "witch hunt," the pejorative Trump often uses to describe Mueller's investigation. He criticized Trump's tweet last week saying that Russian President Vladimir Putin continues to deny meddling in the 2016 election to help Trump win the White House. "Simply accepting the denial of Mr. Putin is not sustainable," Cohen said. Cohen said that if Trump or his legal team try to discredit him or his legal work for Trump over the past decade, he would fight back. Cohen said he did the interview as a first step toward "resolution" of his involvement with Trump.